Michelle Darmody’s idea of a café is simple: there’s good coffee, tempting baking cooling on the counter and an uncomplicated menu using good quality Irish ingredients. The crockery is mismatched, there are piles of well-used cookbooks on the shelves and the iced cookies are quirky and irresistible. Having been a fan of Michelle’s previous establishment, the Curved Street Café, I was thrilled when the Cake Café opened in 2006. Just down the road from where I lived in Rathmines, it was tucked behind the Daintree paper shop on Camden Street, and Saturday morning brunch (homebaked beans on toast!) was a regular treat when we lived in Dublin. There was often an element of theatre about the place too, it being highly entertaining to watch as loving couples, fresh from negotiating their way through Daintree, tensely ‘discussed’ their wedding stationary needs over cups of tea and carrot cake. Michelle has always been ahead of the curve: she’s been namechecking suppliers since she opened, using free-range eggs and butter in her baking from the start, and the Daintree Buildings are a delightfully 21st-century sustainable eco-rain-water-flush-toilet-type space. When she thought about writing a cookbook, she decided to strike out on her own and went through Fundit to raise enough money to self-publish something unique. As a result, The Cake Café Bake Book is a collaboration with Niall Sweeney from Pony. There are no carefully crafted photos, no creative food styling, just lots of bright, cheery illustrations and it already looks like an instant design classic. My only quibble would be with the fact that each two-page spread fits three to four recipes, rather than the one+photo in most cookbooks. As a result, the book looks less substantial at first glance than its 50+ recipes might imply. While leisurely brunches in the city and uninterrupted perusal of the newspapers over Cake Café coffee may be a thing of the past, at least I now have Michelle’s recipes right in my own kitchen – and a little helper ready to get her hands into the bowl. Everyone’s favourite Lemon Slices were the first thing made and we’ve already earmarked some other treats. Spiced Rhubarb Cake, Ginger Hugs and Butter Kisses are all on the to-try list. Now I just need to figure out the secret of those baked beans. Michelle uses a 23 x 23 cm square tin but I like my Lemon Slices a little thinner so used a 25cm x 38cm x 4cm Swiss roll tin. It wasn’t quite deep enough so I had enough of the topping left over to make two small baked lemon custards. The timings have been adjusted for the thinner slice. Preheat the oven to 180°C (fanbake 160°C) and line a 25cm x 38cm x 4cm Swiss roll tin with greaseproof paper. Put the base ingredients – flour, butter, icing sugar, lemon zest and salt – into a large bowl and rub together until they resemble rough bread crumbs. Alternatively, you can do this in a food processor – less mess, but not half as much fun for a Little Missy. Press the base into the tin, using the back of a large spoon. Cook for 12-15 minutes until light golden brown. Allow to cool for a couple of minutes but leave the oven on. Meanwhile, beat the eggs, salt, lemon zest and caster sugar for the topping together – I used a handheld electric whisk – until light, white and doubled in volume. 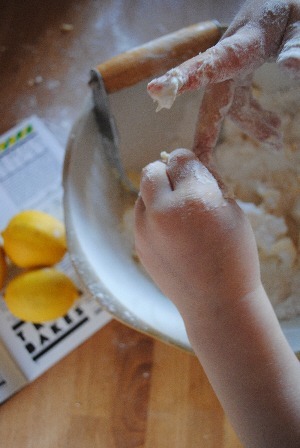 Gently mix in the lemon juice, baking powder and plain flour. Pour carefully on top of the base. If there’s too much, you can bake this in little ramekins as a special cook’s treat. Bake for 15-18 minutes until set. Cool on a wire tray before cutting into slices. Adapted from The Cake Café Bake Book by Michelle Darmody. The book is available direct from www.thecakecafe.ie at €15.95 plus p&p. I found my copy at Stone House Books in Kilkenny. I made the Lemon Slice. The recipie did not say how much butter to use in the base also at what point I should add the lemom juice. My base wasn’t chrisp. I would like to perfect it. The butter is the second ingredient in this recipe – you need “250g butter, cubed”. With regard to the lemon juice, you add it where it says “Gently mix in the lemon juice, baking powder and plain flour.” That’s the fourth paragraph in the recipe. If you’re trying to get the base crisp, make sure you cook it until it turns a light golden brown BEFORE you add the lemon topping. Everyone’s oven is different and yours might take a little longer than 12-15 minutes. Best of luck with your experiments. Even if it’s not perfect, I’ll bet that it still tasted fantastic!